A simple PVC eraser has helped an international team of scientists led by bioarchaeologists at the University of York to resolve the mystery surrounding the tissue-thin parchment used by medieval scribes to produce the first pocket Bibles. Thousands of the Bibles were made in the 13th century, principally in France but also in England, Italy and Spain. But the origin of the parchment -- often called 'uterine vellum' -- has been a source of longstanding controversy. Use of the Latin term abortivum in many sources has led some scholars to suggest that the skin of fetal calves was used to produce the vellum. Others have discounted that theory, arguing that it would not have been possible to sustain livestock herds if so much vellum was produced from fetal skins. Older scholarship even argued that unexpected alternatives such as rabbit or squirrel may have been used, while some medieval sources suggest that hides must have been split by hand through use of a lost technology. A multi-disciplinary team of researchers, led by Dr Sarah Fiddyment and Professor Matthew Collins of the BioArCh research facility in the Department of Archaeology at York, developed a simple and objective technique using standard conservation treatments to identify the animal origin of parchment. The non-invasive method is a variant on ZooMS (ZooArchaeology by Mass Spectrometry) peptide mass fingerprinting but extracts protein from the parchment surface simply by using electrostatic charge generated by gentle rubbing of a PVC eraser on the membrane surface. The research, which is published in Proceedings of the National Academy of Sciences (PNAS), involved scientists and scholars from France, Belgium, Denmark, Ireland, the USA and the UK. They analysed 72 pocket Bibles originating in France, England and Italy, and 293 further parchment samples from the 13th century. The parchment samples ranged in thickness from 0.03 -- 0.28mm. Dr Fiddyment said: "We found no evidence for the use of unexpected animals; however, we did identify the use of more than one mammal species in a single manuscript, consistent with the local availability of hides. "Our results suggest that ultrafine vellum does not necessarily derive from the use of abortive or newborn animals with ultra-thin skin, but could equally reflect a production process that allowed the skins of maturing animals of several species to be rendered into vellum of equal quality and fineness." The research represents the first use of triboelectric extraction of protein from parchment. The method is non-invasive and requires no specialist equipment or storage. Samples can be collected without need to transport the artifacts -- researchers can sample when and where possible and analyse when required. Bruce Holsinger, Professor of English and Medieval Studies at the University of Virginia and the initial humanities collaborator on the project, said: "The research team includes scholars and collaborators from over a dozen disciplines across the laboratory sciences, the humanities, the library and museum sciences--even a parchment maker. In addition to the discoveries we're making, what I find so exciting about this project is its potential to inspire new models for broad-based collaborative research across multiple paradigms. We think together, model together, write together." Alexander Devine, of the Schoenberg Institute for Manuscript Studies at the University of Pennsylvania, said: "The bibles produced on a vast scale throughout the 13th century established the contents and appearance of the Christian Bible familiar to us today. Their importance and influence stem directly from their format as portable one-volume books, made possible by the innovative combination of strategies of miniaturization and compression achieved through the use of extremely thin parchment. The discoveries of this innovative research therefore enhance our understanding of how these bibles were produced enormously, and by extension, illuminate our knowledge of one of the most significant text technologies in the histories of the Bible and of Western Christianity." The Enigma of the Voynich Manuscript: History or Hoax? Professor Collins added: "The level of access we have achieved highlights the importance of this technique. Without the eraser technique we could not have extracted proteins from so many parchment samples. Further, with no evidence of unexpected species, such as rabbit or squirrel, we believe that 'uterine vellum' was often an achievement of technological production using available resources." Since finishing the work, parchment conservator Jií Vnouček, a co-author on the paper, has used this knowledge to recreate parchment similar to 'uterine vellum' from old skins. 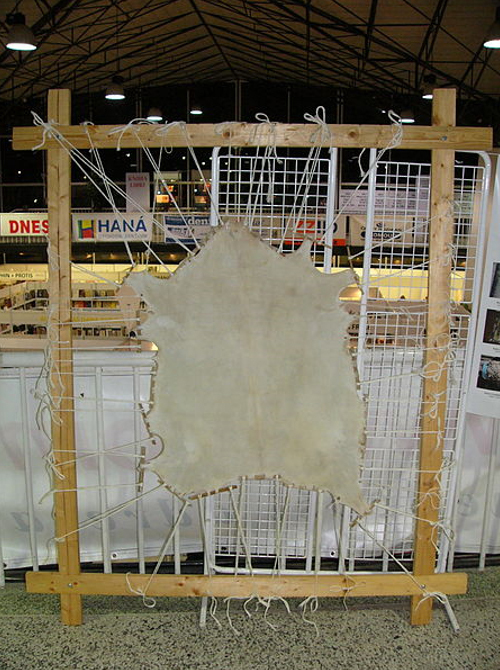 He said: "It is more a question of using the right parchment making technology than using uterine skin. Skins from younger animal are of course optimal for production of thin parchment but I can imagine that every skin was collected, nothing wasted." 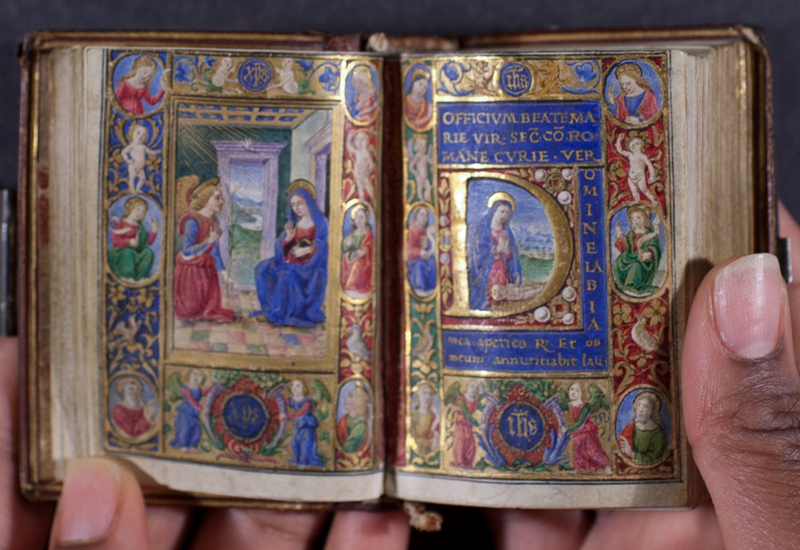 Featured image: Manuscript of the ‘Book of Hours’ produced in Florence in the late 15th century. It is on uterine vellum. Credit: Rauner Special Collections Library. Source: University of York. "Getting under the skin of a medieval mystery." ScienceDaily. ScienceDaily, 23 November 2015. www.sciencedaily.com/releases/2015/11/151123201941.htm. I'm very distressed to see a picture of a man without gloves handling such precious artifacts from our history. Gloves can inhibit your sense of touch so it can increase your risk of tearing. Coupled with the organic materials becoming more brittle and prone to tearing over time this negates the benefits of using gloves. Some archives do not require gloves because of this and require you to wash your hands with soap regularly to reduce the oils and dirt on your hands and prohibit the use of products on your skin (like lotion). They will provide book snakes and other tools to reduce the time you are touching the books and manuscripts.